AGRI is a double blind peer reviewed journal published by the Turkish Society of Algology. 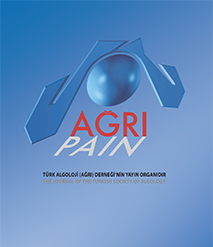 This journal, which is published quarterly, is the official publicalion of Turkish Society of Algology, Reviews, details of interentional techniques, original researehes and case reports on the nature, mechanisms and treatment of pain are published. The journal provides a forum for the dissemination of research in the basic and clinical sciences of multidisciplinary interest.Opinions presented in published articles by no means represent the official endorsement of the Turkish Society of Algology. Articles and illustrations become the property of the Journal after publication. The journal is published in Turkish and in English. Manuscripts which are accepted by Editorial Board can be published. The Editorial Board have the right ro reject or to send the manuscript for review and revise. All manuscripts are subject to editing and, if necessary, will be returned to the authors for responses to outstanding questions or for addition of any missing information. For accuracy and clarity, a detailed manuscript editing is undertaken for all manuscripts accepted for publication. Final galley proofs are sent to the authors for approval. Articles not written according ro the 3rd editian (1983) of “common properties which are wanted in the articles that will be submitted to the Biomedical Journals” which was deternıined by the International Medical Journal Editorial Board, will not be accepted. Before submission it is adviced to look for these guidelines whieh are published in British Medical Journal 1988;296:401-5 or in Annals of Internal Medicine 1988;108:258-65. All paper types are accepted via internet based manuscript processing system (www.journalagent.com/agri). A paper which has not previously been published or being considered for publication elsewhere are accepted for publication. Papers which were published elsewhere previously as an abstract form may be published. No payment for copyright of the article will be done. Therefore the letter accompanying the manuseript should include a statement that copyright of the article is transferred to the Turkish Society of Algology. The final manuscript should have been read and approved by the responsible authors. If illustrations or other small parts of articles or books aIready published elsewhere are used in papers submitted to journal, the written permission of author and publisher corcerned must be included with the manuscript. Authors should keep a copy of their manuscripts. If a part or whole of a submitted manuscript will be published elsewhere, editor of the journal should be informed. For researches, approvement of the institutional local ethics committee or its equivalent should be submitted. All the responsibilities belong to authors. No reprints will be sent to the author. Corresponding author(s) full name, contact information including address, phone, and e-mail address. Conflict of interest statement: A conflict of interest statement should be provided in bottom of the title page. Please list of all potential conflicts of interest for each author, in accordance with ICMJE recommendations. In case of no conflicts of interests, please provide a statement such as: “Conflicts of Interest: None declared”. This combined file with the sections of abstracts, keywords, main text, references with/without tables should be a blinded version of the original manuscript. The names of the authors’, and any identifying information including the academic titles, institutions and addresses must be omitted. Apart from the stage of the manuscript evaluation process, manuscripts submitted with any information pertaining to the author(s) will be rejected as soon as it is noticed. Conflict of Interest Form: A conflict of interest exists when professional judgment concerning a primary interest (such as patients’ welfare or validity of research) may be influenced by a secondary interest (such as financial gain). Financial relationships are easily identifiable, but conflicts can also occur because of personal relationships or rivalries, academic competition, or intellectual beliefs. A conflict can be actual or potential, and full disclosure to The Editor is the safest course. Failure to disclose conflicts might lead to publication of an Erratum or even to retraction. All submissions to AGRI must include disclosure of all relationships that could be viewed as presenting a potential or actual conflict of interest. All authors are required to provide a conflict of interest statement and should complete a standard form. Before the corresponding author submits the manuscript, all of the authors must obtain an ORCİD ID number and provide it to the corresponding author. The corresponding author must then submit all of the ORCID ID numbers through the online manuscript system. Manuscript format must be in accordance with the ICMJE-Recommendations for the Conduct, Reporting, Editing and Publication of Scholarly Work in Medical Journals(updated in August 2013). Papers that do not comply with the format of the Journal will be returned to the author for correction without further review. Therefore, to avoid loss of time and work, authors must carefully review the submission rules. The manuscript should be typed in a Microsoft Word™ file, single-column format, Every effort should be made to avoid medical jargon. For the Blind Initial Review: The names of the authors’, and any identifying information including the academic titles, institutions and addresses must be omitted. Manuscripts submitted with any information pertaining to the author(s) will be rejected. Abbreviations: We discourage the use of any but the most necessary of abbreviations. They may be a convenience for an author but are generally an impediment to easy comprehension for the reader. All abbreviations in the text must be defined the first time they are used (both in the abstract and the main text), and the abbreviations should be displayed in parentheses after the definition. Authors should avoid abbreviations in the title and abstract and limit their use in the main text. Article: Süleyman Ozyalçin N, Talu GK, Camlica H, Erdine S. Efficacy of coeliac plexus and splanchnic nerve blockades in body and tail located pancreatic cancer pain. Eur J Pain 2004;8:539-45. Book: Newton ML. Current practice of pain. 1st ed. St. Luis, MO: Mosby; 1990. Book Chapter: Turner JA. Coping and chronic pain. In: Bond MR, Charlton JE, Woolf CJ, editors. Pain research and clinical management. Proceedings of the VIth world congress on pain. Amsterdam: Elsevier; 1991. p. 219-27. Courses and Lectures (unpublished): Erdine S. Pain. Course lecture presented at: International Pain Congress, June 7, 2008, İstanbul. Abstracts Page: Both English and Turkish (if relevant) abstracts are required. Abstracts should not exceed 250 words and should be structured with the following subheadings: Objectives, Material and Methods (with design), Results, and Conclusion (case control study, cross sectional study, cohort study, randomized controlled trial, diagnostic accuracy study, meta-analysis and systemic review, animal experimentation, non-randomized study in behavioral sciences and public health, etc.). In your results emphasize the magnitude of findings over test statistics, ideally including the size of effect and its confidence intervals for the principal outcomes. Introduction: A three-paragraph structure should be used. Background information on study subject (1st paragraph), context and the implications of the study (2nd paragraph) and the hypotheses and the goals of the study (3rd paragraph). Background: Describe the circumstances or historical context that set the stage and led you to investigate the issue. Context: Describe why your investigation is consequential. What are its potential implications? How does it relate to issues raised in the first paragraph? Why is this specific investigation the next logical step? Goals of the study: Clearly state the specific research objective or hypothesis and your primary outcome measure. Discussion: The main and secondary results of the study should briefly presented and compared with similar findings in the literature. Providing intensive background information should be avoided in this section. Consider only those published articles directly relevant to interpreting your results and placing them in context. Do not stress statistical significance over clinical importance. Avoid extrapolation to populations or conditions that you have not explicitly studied in your investigation. Avoid claims about cost or economic benefit unless a formal cost-effectiveness analysis was presented in the Methods and Results sections. Do not suggest “more research is needed” without stating what the specific next step is. Optionally, you may include a paragraph “In retrospect, . . .” to candidly discuss what you would do differently if given the opportunity to repeat the study, so others can learn from your experience. Limitations: The limitations of the study should be mentioned in a separate paragraph subtitled as the “Limitations” in the end of the discussion. Explicitly discuss the limitations of your study, including threats to the internal and external validity of your results. When possible, examine the magnitude and direction of each bias and how it might affect the interpretation of results. Case Reports: Brief descriptions of clinical cases or the complications that are seldom encountered in algology practice and have an educational value. Consideration will be given to articles presenting clinical conditions, clinical manifestations or complications previously undocumented in the existing literature and unreported side of adverse effects of the known treatment regimens or scientific findings that may trigger further research on the topic. Abstracts of case reports should mainly include information about the case, should not exceed 150 words, must be on a separate page and should be unstructured. The main text of Case Series should be structured with the following subheadings: Introduction, Case Presentations, Discussion and References. Review Article: Comprehensive articles reviewing national and international literature related to current algology practice. Generally AGRI Journal publishes only invited review articles. Other authors should contact the editor prior to submission of review articles. Maximum 2 authors, 4000 words (including references, tables, and figure legends). There is no limit to the number of references. Letter to the Editor: Opinions, comments and suggestions made concerning articles published in AGRI Journal or other journals. Letters should contain a maximum of 1,000 words and 5 references are allowed for these single author submissions. No abstract is required. Patients have a right to privacy that should not be infringed without informed consent. Identifying information, including patients’ names, initials, or hospital numbers, should not be published in written descriptions, photographs, and pedigrees unless the information is essential for scientific purposes and the patient (or parent or guardian) gives written informed consent for publication. Informed consent for this purpose requires that a patient who is identifiable be shown the manuscript to be published. Authors should identify Individuals who provide writing assistance and disclose the funding source for this assistance. Identifying details should be omitted if they are not essential. Please print out the form (Statement of Informed Consent Form), fill in the details about the article, ask the patient or next of kin to sign the form, and sent to publisher by fax or electronic submitting system after signing the form. The Agri is an open access journal which means that all content is freely available without charge to the user or his/her institution. Users are allowed to read, download, copy, distribute, print, search, or link to the full texts of the articles, or use them for any other lawful purpose, without asking prior permission from the publisher or the author. This is in accordance with the BOAI definition of open access. AGRI is an open access journal. There is no fee for article submission, article processing or publication. Manuscripts can be reached from the web page of journal without any fees.